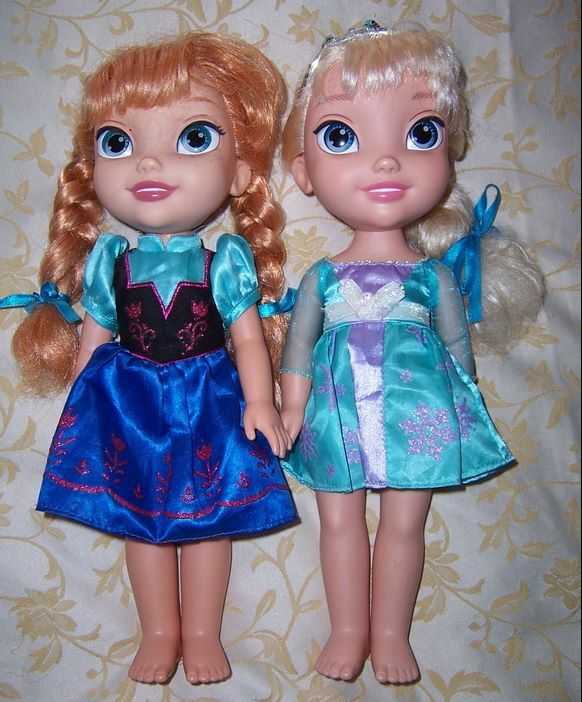 Elsa and Anna are characters from the Disney movie called Frozen. They are both dressed in their original signature dress from the film and we have tied their hair with brand new blue satin ribbons. 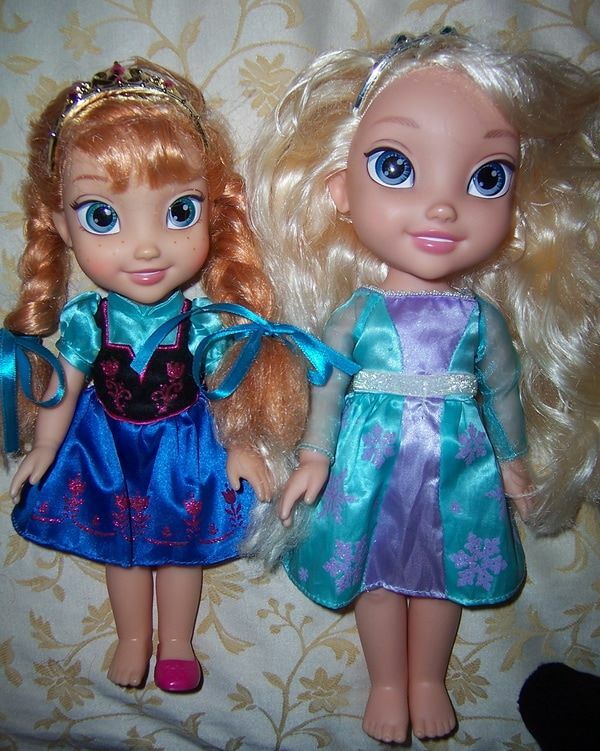 Anna & Elsa are both all vinyl jointed dolls with wonderful large reflective eyes. Anna &Elsa are characters from the Disney movie called Frozen. They are both dressed in pretty sparkly party dresses. We have washed and brushed their hair and is now tangle free but is a little dry at the ends. 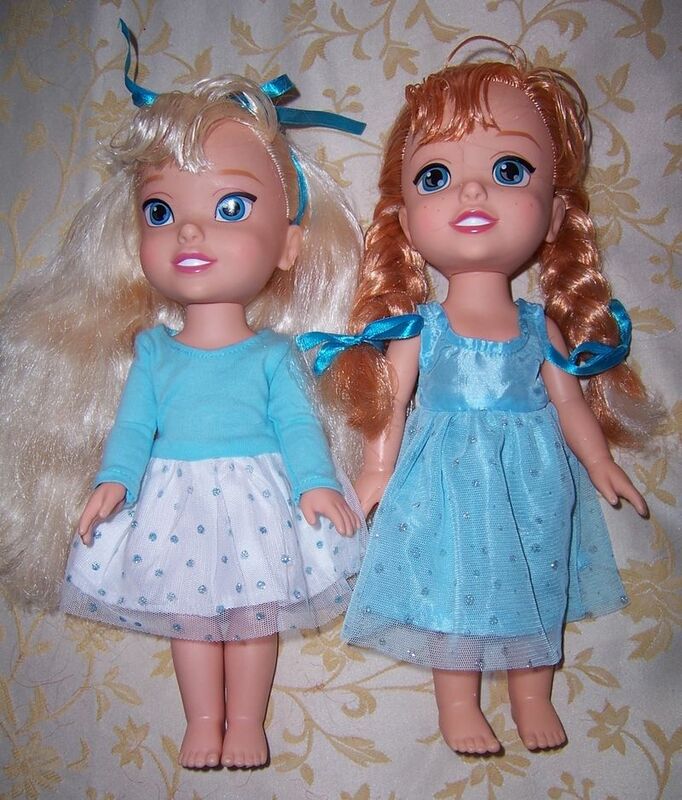 Anna & Elsa are all vinyl jointed dolls with large painted blue eyes. Theses dolls are the smaller toddler body dolls. They are both dressed in their original tiaras on ther head and signature dress from the film. We have tied Anna's hair with brand new blue satin ribbons. Anna is the smaller doll - 30cm tall. She has lost one shoe. Elsa is the sister who was born with icy powers, and is portrayed as a wide-eyed little girl. 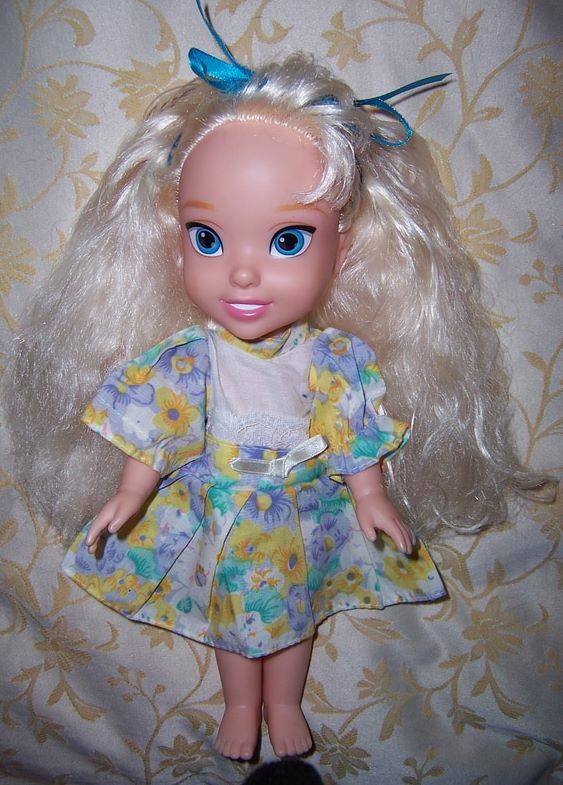 She is dressed in her original signature dress from the film and we put her hair up in a ponytail tied with a blue satin ribbon but looks just a nice loose or tied in a braide. She is also wearing her original blue tights, has lost her original shoes. 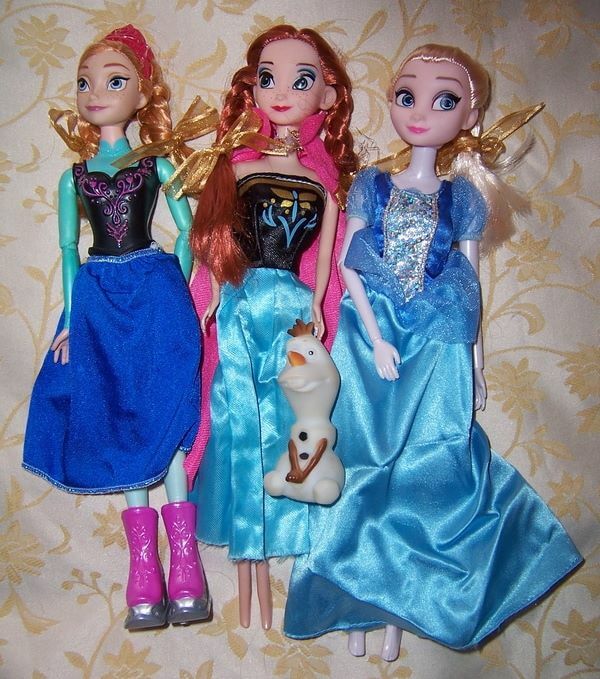 These three dolls are characters from the Disney movie called Frozen. is dressed in her original signature dress from the film and has her pretty auburn hair in two braides down her back. .wearing her crown, and has her skate boots on her feet.
. fashion doll like Barbie and is jointed at the neck, arms, elbows, legs and one knee is jointed. One of her boots has a roller action underneath to help her skate. 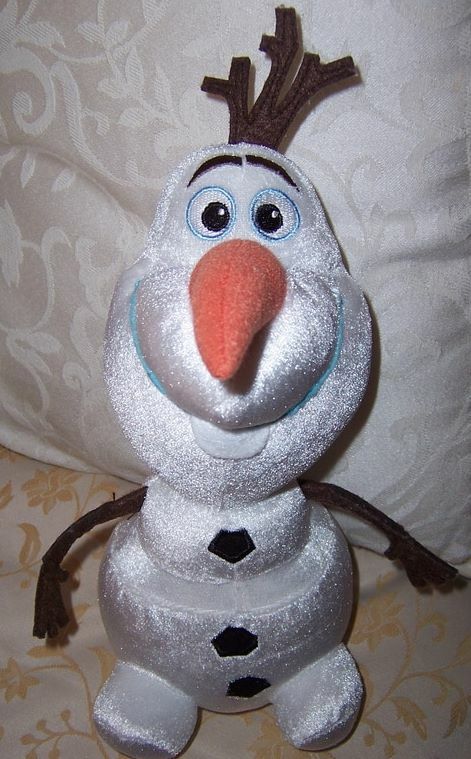 Olaf is a character from the popular Disney movie Frozen. He is called ''the friendliest Snowman to walk the mountains above Arendelle''. He is very clean and soft to touch. 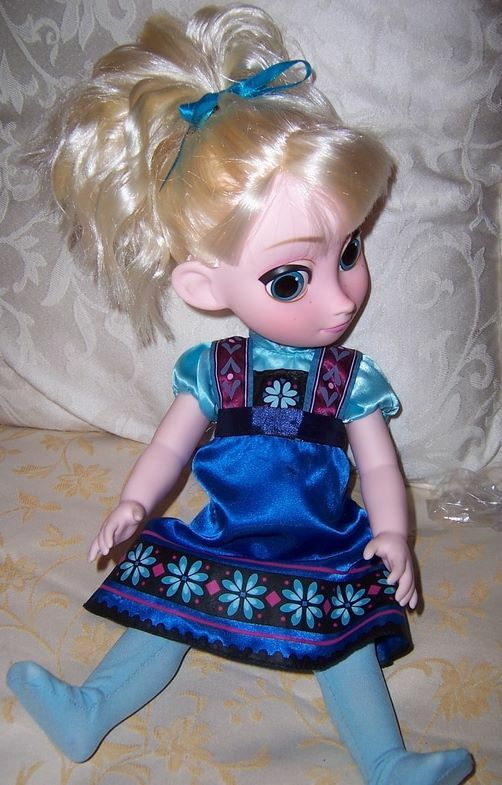 Elsa is the smaller toddler body Frozen doll, and is approx. 30cm tall. Her hair has been washed and brushed, and is lovely and soft. We have tied it with a new blue satin ribbon. She has blue painted eyes. She has lost her original dress but we have given her another dress which fits her well. (the elastic in one sleeve has come loose).